New photographs reveal that MAD's residential complex in California, designed to look like a village on top of a hill, has topped out. 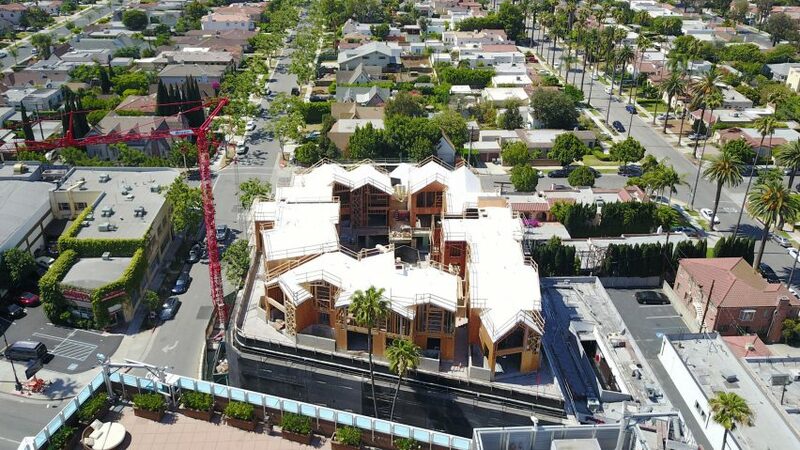 Slated for completion later this year, Gardenhouse is under construction at 8600 Wilshire Boulevard in Beverly Hills. It will be the first US project by the Chinese architecture studio. The construction photos, released by MAD, show that the building's large "hill" podium is complete, as are the 18 gabled houses that sit on top. These rooftop structures vary in height as they will contain a mixture of housing typologies, including villa-style townhouses, villas, studios and condominiums. They have wooden frameworks, but will eventually be clad in white glass. The photography also shows a large atrium at the centre of the complex, containing a protected courtyard for residents. Some of the residences will have plant-covered balconies facing this space, while others will include hidden private terraces, as shown in renderings released last year. "We want to bring the green atmosphere into what would traditionally be considered compact, condo living, by breaking down the scale and massing of the building," said MAD founder Ma Yansong. "Rather than develop architecture where nature exists around the building, we want to give residents the experience of being in the middle of nature, while they enjoy the conveniences of big city living." MAD first unveiled plans for Gardenhouse back in 2015. The scheme includes shops as well as residences within its podium, which will be completely covered in foliage to resemble a hill. The architects plan to use native planting, drought-tolerant succulents and vines, making this one of the largest green walls in the US. MAD is renowned for integrating nature into its building designs. A number of its projects are based on the concept of translating Chinese landscape paintings, known as shan-shui, into architecture. Examples include Huangshan Mountain Village and Chaoyang Park Plaza, both in China. The firm is also working on another project in the US – the Lucas Museum of Narrative Art broke ground in Los Angeles earlier this year, following a saga that saw the project moved across the country from Chicago.